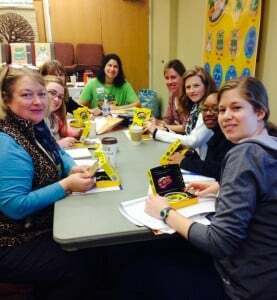 On Saturday in Vienna, VA we had a fantastic professional development workshop for our reading tutors. We employ many teachers who help students with reading disorders, such as dyslexia. Our guest attendee was Jackie Paris, inventor of Funny Mix, one of the best reading games on the market. I was invited to present the FUNNY MIX reading game at a workshop sponsored by Educational Connections tutoring company on April 5, 2014. Ann Dolin, the owner of Educational Connections, was delighted to learn of the FUNNY MIX reading game! She immediately recognized the card game as an innovative and fun way to practice phonemic awareness and phonics and wanted to share it with her reading tutors. 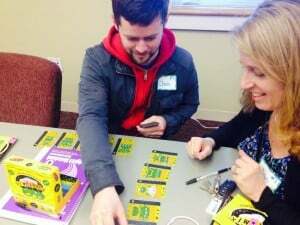 I was honored to be a part of an Educational Connections’ workshop as their tutors provide each child with an effective path to reading success. The FUNNY MIX game was so well received that the tutors couldn’t wait to play the game with their students! One tutor relayed to me that she was so happy she was tutoring a young girl later that day so that she could play the game with her! What makes the FUNNY MIX card game so unique is that the game consists of 14 Super Heroes whose names contain every letter of the alphabet. Zip, Web, Yum, Box, and Hat are the short vowel characters. Dive, Pete, Cube, Joke and Game are the long vowel characters. Queen, Leaf, Rain and Soap are additional long vowel characters. Using transparent plastic cards that contain the super heroes’ capes and masks, the child’s job is to stack these 3 cards onto the base card in order to give the character a cape and mask, thus activating their powers! The children get to practice saying the sounds in the names (phonemic awareness) as well as learning the letters (phonics) that make each sound! I developed the game to ensure that all children would experience success playing it. Children who can’t identify letters yet, can simply match the pictures together. Furthermore, there are numbers at the top that children can match together too! The goal is to learn the super heroes’ names, which children have a natural capacity to do. Once, children learn the names, they can practice saying the sounds in the names and learning the letters! The FUNNY MIX reading game also has some cool designs to help children remember the different letter sounds. All of the silent letters are under water because you can’t talk under water. The short vowels are colored green matching the green super heroes. The long vowels are all blue and match the blue super heroes. Thank you, Ann Dolin, for the opportunity to be a part of such a wonderful tutoring workshop! Here’s to helping ALL children learn to read! To learn more about the FUNNY MIX reading game, please visit the website readventuresgames.com and the Readventures Facebook page.